Home » Therapies » What is Music Therapy and How Does It Work? Have you ever been going about your daily business, when all of a sudden you hear a song that takes you right back to a significant time in your life? Perhaps the music leaves you feeling calmer. Or happy. Or, let’s face it, downright sad. I am sure all of us can attest to the power of music. Did you know, however, that music therapy is in itself an evidence-based therapy? Keep reading to learn more about the profession of music therapy. What is Music Therapy Perspectives? Bruscia (1991) defined music therapy as ‘an interpersonal process in which the therapist uses music and all of its facets to help patients to improve, restore or maintain health’ (Maratos, Gold, Wang & Crawford, 2008). A little later, in 1998, Bruscia suggested another alternative definition of music therapy as ‘a systematic process of intervention wherein the therapist helps the client to promote health, using musical experiences and the relationships that develop through them as dynamic forces of change’ (Geretsegger, Elefant, Mössler & Gold, 2014). Does music therapy simply consist of music used therapeutically? As Bruscia’s definitions demonstrate, music therapy is much more complex. It shouldn’t be confused with ‘music medicine’ – which is music interventions delivered by medical or healthcare professionals (Bradt & Dileo, 2010). Music therapy, on the other hand, is administered by trained music therapists (Bradt & Dileo, 2010). How does music therapy work? Well, it is claimed that five factors contribute to the effects of music therapy (Koelsch, 2009). The first aspect is the modulation of attention (Koelsch, 2009). Music grabs our attention and distracts us from stimuli that may lead to negative experiences (such as worry, pain, anxiety and so on) (Koelsch, 2009). This may also explain the anxiety and pain-reducing effects of listening to music during medical procedures (Koelsch, 2009). The second way music therapy work is through modulation of emotion (Koelsch, 2009). Studies have shown that music can regulate the activity of brain regions that are involved in the initiation, generation, maintenance, termination, and modulation of emotions (Koelsch, 2009). Music also modulates cognition (Koelsch, 2009). Music is related to memory processes (including the encoding, storage, and decoding of musical information and events related to musical experiences) (Koelsch, 2009). It is also involved in the analysis of musical syntax and musical meaning (Koelsch, 2009). Music therapy also works through modulating behavior (Koelsch, 2009). Music evokes and conditions behaviors such as the movement patterns involved in walking, speaking and grasping (Koelsch, 2009). Music also affects communication (Koelsch, 2009). In fact, music is a means of communication (Koelsch, 2009). Therefore, music can play a significant role in relationships, as alluded to in the definition of music therapy (Koelsch, 2009). Musical interaction in music therapy, especially musical improvisation, serves as a non-verbal and pre-verbal language (Geretsegger et al., 2014). It allows people who are verbal to gain access to pre-verbal experiences (Geretsegger et al., 2014). It also gives non-verbal people the chance to communicate with others without words (Geretsegger et al., 2014). It allows all people to interact on a more emotional, relationship-oriented way than may be possible relying on verbal language (Geretsegger et al., 2014). Interaction also takes place with listening to music by a process that generally includes choosing music that has meaning for the person, such as the music reflecting an issue that the person is currently occupied with (Geretsegger et al., 2014). Wherever possible, individuals are encouraged to reflect on personal issues that relate to the music, or, associations that the music brings up (Geretsegger et al., 2014). For individuals who have verbal abilities, another important part of music therapy is to reflect verbally on the musical processes (Geretsegger et al., 2014). Looking at a psychological theory of music therapy is extremely challenging, given the fact that there are multiple ideas regarding the mechanisms of music used as a therapeutic means (Hillecke, Nickel & Volker Bolay, 2005). The psychology of music is a relatively new area of study (Wigram, Pedersen & Bonde, 2002). Music therapy is a multi-disciplinary field, and the area of music psychology is an innovative interdisciplinary science drawing from the fields of musicology, psychology, acoustics, sociology, anthropology, and neurology (Hillecke et al., 2005; Wigram et al., 2002). Psychologists use experiments and diagnostics such as questionnaires, and the paradigm of cognition, to analyze what happens in music therapy (Hillecke et al., 2005). The psychology of music performance and composition (Wigram et al., pp 45 – 46). In understanding how people hear and perceive musical sounds, a part of music psychology is psychoacoustics – one’s perception of music (Wigram et al., 2002). Another important facet of the psychology of music is an understanding of the human ear, and also the way the brain is involved in the appreciation and performance of music (Wigram et al., 2002). Lifespan music psychology refers to an individual’s relationship to music as a lifelong developmental process (Wigram et al., 2002). The largest music therapy organization in the world, the American Music Therapy Association traces the formal beginnings of music therapy back to 1789 (Greenberg, 2017). The earliest reference to music therapy was a paper called “Musically Physically Considered”, that was published in a Columbian magazine (Greenberg, 2017). Even long before that, Pythagoras (c.570 – c. 495 BC), the Greek philosopher and mathematician prescribed a variety of musical scales and modes in order to cure an array of physical and psychological conditions (Greenberg, 2017). However, perhaps the earliest account of the healing properties of music appear in the Jewish bible. In it, the story was that David, a skilled musician, could cure King Saul’s depression through music (Greenberg, 2017). “And it happened that whenever the spirit of melancholy from God was upon Saul, David would take the lyre (harp) and play it. Saul would then feel relieved and the spirit of melancholy would depart from him” (1 Samuel, 16:23). There may even be earlier accounts of music therapy. Whether such religious texts are historically accurate or not, music was conceived as a therapeutic modality when such texts were written (Greenberg, 2017). Music therapy emerged as a profession in the 20th century after World War I and World War II (The American Music Therapy Association, n.d.). Both amateur and professional musicians attended veterans’ hospitals to play for the veterans who had suffered physical and emotional trauma (The American Music Therapy Association, n.d.). The impact of the music on the patients’ physical and emotional responses saw the doctors and nurses requesting to hire the musicians. It became apparent that the hospital musicians required training before starting, and thus ensued the beginning of music therapy education (The American Music Therapy Association, n.d.). To begin this discussion into musical therapy research, I will share a couple of Cochrane Reviews. Cochrane Reviews are systematic reviews that are internationally recognized as the highest standard in evidence-based health care. A Cochrane Review of 5 studies examining music used in different ways as a part of the psychological treatment of people with depression found that reporting of the studies was poor (Maratos et al., 2008). It did, however, find that most of the studies that made up the review did show positive effects in reducing depressive symptoms (Maratos et al., 2008). Therefore, the authors suggested that further research in this area is necessary. Another Cochrane Review looked at 10 studies (a total of 165 participants) that assessed the effect of music therapy interventions that were conducted with children with autism spectrum disorder (ASD) over periods ranging from one week to seven months (Geretsegger et al., 2014). Individuals with ASD experience impairments in social interaction and communication (Geretsegger et al., 2014). Music therapy provides a means of communication and expression through musical experiences and the relationships that develop through them (Geretsegger et al., 2014). Geretsegger and colleagues (2014) found that in terms of social interaction within the context of therapy, music therapy was associated with improvements in the non-verbal communicative skills, verbal communication skills, initiating behavior and social emotional reciprocity of individuals with ASD (Geretsegger et al., 2014). However, there was no statistically significant difference in non-verbal communication skills outside the context of the therapy (Geretsegger et al., 2014). In terms of secondary outcomes, music therapy was found to be superior to ‘placebo’ therapy or standard care in promoting social adaptation and quality of the parent-child relationships (Geretsegger et al., 2014). In a Cochrane Review, authors found that a limited range of studies suggest that music therapy may be beneficial on improving quality of life in end-of-life care (Bradt & Dileo, 2010). However, the results are derived from studies that have a high risk of bias. Bradt and Dileo (2010) therefore concluded that more research into this particular area is needed. In other studies, Klassen and colleagues (2008) looked at 19 randomized controlled trials and found that music therapy significantly reduced anxiety and pain in children undergoing medical and dental procedures. The study also showed that rather than the use of music alone, use of music as a part of a multifaceted intervention may be more effective (Klassen, Liang, Tjosfold, Klassen & Hartling, 2008). The music is used to distract the patient from painful or anxiety-provoking stimuli, and this can also reduce the amount of medication required (Klassen et al., 2008). Gerdner and Swanson (1993) examined the effects of individualized music in five elderly patients diagnosed with Dementia of Alzheimer’s Type. The patients resided in a long-term care facility and were confused and agitated (Gerdner & Swanson, 1993). Results from the study, both the immediate effects and the residual effects one hour after the intervention, suggest that individualized music is an alternate approach to management of agitation in confused elderly patients (Gerdner & Swanson, 1993). Forsblom and colleagues (2009) conducted two parallel interview studies of stroke patients and professional nurses to ascertain the therapeutic role of listening to music in stroke rehabilitation. They found music listening could be used to help patients relax, improve their mood and afford both mental and physical activation during the early stages of stroke recovery (Forsblom, Lantinen, Särkämö, & Tervaniemi, 2009). Music listening was described as a ‘participative rehabilitation tool’ (Forsblom, et al. 2009). The final study I will review, by Blood and Zatorre (2001) showed that music modulated amygdala activity. Using brain imaging techniques, the researchers played participants a piece of their own favorite music to induce an extremely pleasurable experience – described as “chills” (Blood & Zatorre, 2001). In the control condition, participants listened to another participant’s favorite music (Blood & Zatorre, 2001). The intensity of the ‘chills’ experienced by participants correlated with increases in regional cerebral blood flow in brain areas believe to be involved in reward and emotion (Blood & Zatorre, 2001). This study supports the argument that music can induce ‘real’ emotions, as the brain regions for emotional processing were modulated by music (Blood & Zatorre, 2001). Music-based therapy is based on two fundamental methods – the ‘receptive’ listening based method, and the ‘active’ method based on playing musical instruments (Guetin, Portet, Picot, Pommè, Messaoudi & Djabelkir, et al., 2009). There are two receptive methods. The first of these, receptive ‘relaxation’ music therapy is often used in the treatment of anxiety, depression and cognitive disorders (Guetin et al., 2009). Receptive ‘analytical’ music therapy is used as the medium for ‘analytic’ psychotherapy (Guetin et al., 2009). ‘Music medicine’ generally involves passive listening to pre-recorded music provided by medical personnel (Bradt & Dileo, 2010). In terms of other types of music therapy, there is the Bonny Method of Guided Imagery and Music. This was developed by Helen Lindquist Bonny (Smith, 2018). The approach involves guided imagery with music. With music added, the patient focuses on an image which is used as a starting point to think about and discuss any related problems (Smith, 2018). Music plays an integral role in the therapy and may be called a ‘co-therapist’ (Smith, 2018). Individual patient needs and goals influence the music that is selected for the session (Smith, 2018). The Dalcroze Eurythmics is a method used to teach music to students, which can also be used as a form of therapy (Smith, 2018). Developed by Èmile Jaques-Dalcroze, this method focuses on rhythm, structure, and expression of movement in the learning process (Smith, 2018). Because this method is apt for improving physical awareness, it helps those patients who have motor difficulties immensely (Smith, 2018). It is thought that Zoltàn Kodàly was the inspiration for the development of the Kodaly philosophy of music therapy (Smith, 2018). It involves using rhythm, notation, sequence, and movement to help the patient learn and heal. This method has been found to improve intonation, rhythm and music literacy (Smith, 2018). It also has a positive impact on perceptual function, concept formation, motor skills and learning performance in a therapeutic setting (Smith, 2018). Neurologic Music Therapy (NMT) is based on neuroscience (Smith, 2018). It was developed considering the perception and production of music and its influence on the function of the brain and behaviors (Smith, 2018). NMT uses the variation within the brain both with and without music and manipulates this in order to evoke brain changes which affect the patient (Smith, 2018). It has been claimed that this type of music therapy changes and develops the brain by engaging with music (Smith, 2018). This has implications for training motor responses, such as tapping the foot to music (Smith, 2018). NMT can be used to develop motor skills (Smith, 2018). Orff-Schulwerk is a music therapy approach developed by Gertrude Orff (Smith, 2018). When she realized that medicine alone was not sufficient for children with developmental delays and disabilities, Orff formed this model (Smith, 2018). “Schulwerk”, or ‘school work’ in German, reflects this approach’s emphasis on education (Smith, 2018). It uses music to help children improve their learning ability (Smith, 2018). This method also highlights the importance of humanistic psychology and uses music as a way to improve the interaction between the patient and other people (Smith, 2018). This information about what music therapists do was found on the ‘Your Free Career Test’ (n.d.) website. Music therapists work in a variety of settings, including schools, hospitals, mental health service locations, and nursing homes. They help a variety of different patients/clients. A music therapist evaluates each clients’ unique needs. They ascertain a client’s musical preferences and devises a treatment plan that is customized for the individual. Music therapists are part of a multi-disciplinary team, working with other professionals to ensure treatment also works for the client to achieve their goals. For example, if a person is working on strengthening and movement in order to address physical limitations, a music therapist could introduce dance into their treatment plan. Therapists are advised to follow their own preferences, and as explained by Rachel Rambach (2016) a board-certified music therapist – instruments are the tools of a music therapist and should be specifically chosen based on the needs and goals of clients. Some instruments are, however, more popular. Muzique (a company promoting creative art experiences) has listed three instruments that have been proven most effective. The first of these is the Djembe, or hand drum. Given that this single drum does not have a central melodic component, the client is free to express and connect with the musical rhythms without fear of playing a ‘wrong note’. The use of a small drum also facilitates a connection between the therapist and client by allowing them to be in close proximity. They can play together at the same time, which may not be possible with a piano or guitar. The guitar, according to Muzique (n.d.) is generally the top instrument used by music therapists. Again, a guitar can be used in close proximity to a client. The music therapist can also maintain melodic or harmonic control whilst allowing the client to play. The guitar can help maintain control in a group setting, but it can also be soothing and relaxing. Muzique (n.d.) suggests that the piano is probably the instrument of choice when working with large groups. As the sound of a guitar can be drowned out by other instruments being played by clients, the piano can be more steady and holding background. The music therapist should be mindful, however, of the apparent physical barrier between themselves and the client, and if possible, have the client sit next to the piano. Rachel Rambach (2016) concedes that there are certain instruments that she tends to utilize more often than others in her work with children. These include the 8 note hand bell set, which consists of a group of bells that each have their own color, number and letter of the medical alphabet (which can be ordered by pitch) and the mini guitar (which is very child-friendly and portable) (Rambach, 2016). Another instrument Rambach (2016) likes is the frog guiro, which can be used in various ways – such as a guiro making a croaking sound, like a frog, or as a wood block. Castanets make a fun sound, and also help children acquire a pincer grip (Rambach, 2016). Rambach (2016) favors fruit shakers, which although they don’t make a unique sound, have a very realistic appearance and thus appeal to children. The cabasa does, on the other hand, make a unique sound and also brings in a tactile element to music therapy (Rambach, 2016). The cabasa is good for targeting fine and gross motor skills (Rambach, 2016). The ‘lollipop’ drum is light, and not too loud so these are often preferred by Rambach (2016) over bigger paddle drums. Rambach (2016) thinks every music therapist should have a ukulele. Their sound is sweet and inviting, and the ukulele makes the perfect alternative to a guitar (Rambach, 2016). They can be used as an accompanying instrument, but also for adapted lessens (Rambach, 2016). Finally, the gathering drum encourages group cohesion in group settings or classes (Rambach, 2016). They encourage children, or adult clients, to work together – sharing, and interacting with others (Rambach, 2016). This enables the individual to slow down a song while retaining the key of the song (Fandom, n.d.). Each song can also be transposed into a different key, and clients can play/sing along to the actual recording (Fandom, n.d.). Select from a range of drum set-ups to play on, and come up with your own beats simply with your fingertips (Fandom, n.d.). You can even play along with the songs in your iTunes library and record the beats that you create (Fandom, n.d.). This application enables the person to type out their raps, select back beats, and record them (Fandom, n.d.). It also provides a search device for rhymes, if you get stuck on trying to find the right word (Fandom, n.d.). The raps that are recorded on them can then be shared and emailed to other devices (Fandom, n.d.). This is a simplified version of Garage Band for Mac computers (Fandom, n.d.). Use smart instruments with pre-recorded patterns and sounds, or, play your own baseline or violin part (Fandom, n.d.). Multiple layers can be recorded – including your own recording (Fandom, n.d.). This app provides a great tool for song-writing or improvisation (Fandom, n.d.). The individual can create literally hundreds of realistic, high-quality sounds (Fandom, n.d.). This application shows you the fingerings for chords, with several options (Fandom, n.d.). It also shows the specific notes on the frets when playing a chord or the finger number for the chord (Fandom, n.d.). The app provides guitar triads, arpeggios, a reverse chord finder tool, alternate guitar tunings, chords scale relationships and a guitar chord quiz (Fandom, n.d.). This enables you to play the piano with no prior knowledge (Fandom, n.d.). The application works by tapping the glowing lights when they reach the bottom of the screen and it sounds the corresponding note on the piano (Fandom, n.d.). The app can also be switched to where you have to hit the right spot (or the note will sound out of tune if not) or just tap the screen with the rhythm (Fandom, n.d). It has 4 different difficulty settings: easy, medium, hard and auto mode that senses the person’s ability after a few songs (Fandom, n.d.). This is an app that includes famous songs’ notes, such as ‘do re mi’ (Sena, 2012). It can be used to teach individuals how to play melodica (keyboard) and it is excellent preparation for later piano education (Sena, 2012). This app has electric and acoustic guitar sounds recorded with live guitars (Sena, 2012). It can be used to learn how to play the guitar, providing the chords and tabs (Sena, 2012). It has a vast range of options and is perfect for both beginners and experienced guitarists (Sena, 2012). The following information was found on the ‘Voices’ website. This is an open-access peer-reviewed journal. It welcomes dialogue and discussion across disciplines about music, health, and social change. The journal promotes inclusiveness and socio-cultural awareness. It features a focus on cultural issues and social justice. “Voices: A World Forum for Music Therapy seeks to nurture the profile of music therapy as a global enterprise that is inclusive and has a broad range of influences in the International arena. The forum is particularly interested in encouraging the growth of music therapy in developing countries and intends to foster an exchange between Western and Eastern as well as Northern and Southern approaches to the art and science of music therapy”. An official publication of the American Music Therapy Association aim, is to inform readers from both within and outside the music therapy profession. By disseminating scholarly work, this journal sets out to promote the development of music therapy clinical practice, with a particular focus on clinical benefits. Music Therapy Perspective seeks to be a resource and forum for music therapists, music therapy students, and educators as well as others from related professions. The Journal of Music Therapy disseminates research (edited by A. Blythe LaGasse) that advances the science and practice of music therapy. It also provides a forum for current music therapy research and theory, including book reviews and guest editorials. “Its mission is to promote scholarly activity in music therapy and to foster the development and understanding of music therapy and music-based interventions…The journal strives to present a variety of research approaches and topics, to promote clinical inquiry, and to serve as a resource and forum for researchers, educators, and clinicians in music therapy and related professions”. This book is a key resource for music therapists and also demonstrates how music therapy can be used by other mental health and medical professionals. It provides case material and an extensive look at music therapy, including both the basic concepts as well as the emerging clinical approaches. It contains a comprehensive section on clinical applications. This is a revised, updated version of Hanser’s 1987 book. It reflects recent developments in the field of music therapy. This book serves as a ‘go-to’ resource for both students and professionals. It contains an introduction to music therapy as a profession, provides guidelines for setting up a practice, and describes new clinical applications as well as relevant case studies. This book is suitable as a reference, a textbook for students, or simply to provide an introduction to the field of music therapy. It is made up of 42 case-histories of children, adolescents and adults receiving group and individual therapy in a range of different settings, in order to demonstrate the process of music therapy from beginning to end. The book describes various approaches and techniques in music therapy, and captures moving stories of people worldwide who have benefitted from music therapy and the relationships developed with music therapists. Bruscia’s book examines the unique difficulties of defining music within a therapeutic context and, conversely, defining therapy within a music context. It compares and examines more than 40 definitions of music therapy and provides a new definition. Bruscia discusses each component of this new definition and by doing so suggests boundaries for what music therapy IS versus what it IS NOT. This book is slightly different to the others. It examines the place music occupies in the brain, and how music affects the human condition. Sacks explores cases of what he terms “musical malalignment”. He explains why music is irresistible and can be both healing and unforgettable. Music Therapy: Healing Music Sound Therapy for Relax, Chakra Balancing, and Well-being. From the Meditation Relax Club. Suitable for use in relaxation exercises or meditation, this video features peaceful, calming music set against a tranquil video. Trish, a music therapist, explains her role. She also explains how music therapy can help clients to meet both medical and emotional needs. By sharing a description of working with a child with autism spectrum disorder, this board-certified music therapist explains what happens in a music therapy session. This video gives a brief snapshot of what music therapy looks like. This video shows the music therapy department at the Children’s Hospital of Pittsburgh of UPMC. It explains how board-certified music therapists assist patients to cope with procedures, pain and anxiety. The power of music has been evident since the earliest days of humankind. However, after the world wars of the 20th century, music therapy heralded the beginning of a powerful new profession. Since then, various types and methods of music therapy have been developed, and music therapy has been practiced in a variety of settings with far-reaching benefits. 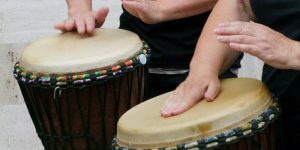 Hopefully, this article has provided you with a helpful overview of the music therapy profession. What are your experiences with music therapy? What do you think it offers clients in conjunction with traditional therapies? Or, have you had experience of music therapy as a stand-alone intervention? Please feel free to share your thoughts and ideas.